This means a measure of the acidity or alkalinity of your soil. If you examine your soil and the pH is too low or too high then you would like to try and get the soil back to a neutral 7. If your pH is under 7 it means your soil is acidic. To fix soil that is too acidic you can put in some common garden lime to the soil. Mix the lime into the soil really well and aerate it. Let that sit for a bit and then test again and the pH should be closer to neutral. If the soil pH levels is higher than a 7 it’s too alkaline. The best way to bring a high pH level close to neutral is to add a lot of natural compost or manure. Add a thick layer of compost or manure over the top of the soil and aerate the soil to mix the compost into the soil. After about a week check the soil pH again and it should be lower. A moderate soil pH levels provides the best environment for the soil-dwelling microorganisms that make nutrients, especially nitrogen, available to plants. If the soil pH is too low or high, nutrients needed by plants to make food will not dissolve quickly and may turn into soluble forms that the plant cannot use. For the best plant growth, you should keep the landscapes pH between 6 and 7, a slightly acidic. Many soils naturally fall within this range, but some need to be corrected. If you want to check just the pH of your soil without having to take an entire soil test, use the commercially available plastic strips with pH-sensitive dyes or a meter that measures the soil’s pH from electrodes inserted into the soil. The strips are almost as accurate as the meters and cost a lot less. When soil pH is below 6, certain nutrients do not dissolve well and cannot be absorbed by most plants, except acid-loving plants. Nitrogen, phosphorus, and other major nutrients are locked into more complex compounds that do not readily break down to release these nutrients. Without these elements, plants have trouble producing food. If your soil is too acid, you need to add lime stone, wood ashes, or organic material to raise the pH. Once the pH level raises and stabilizes between 6 and 7, locked-up nitrogen and phosphorus will gradually unbound and become available for uptake by the roots of the plants. 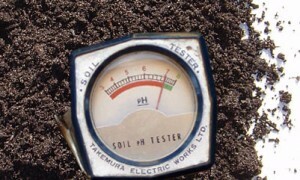 A pH reading of over 7 indicates an alkaline soil. By adding gypsum (calcium sulfate), aluminum sulfate, powdered sulfur, or organic matter, you can bring the pH to a neutral level more acceptable to most plants.